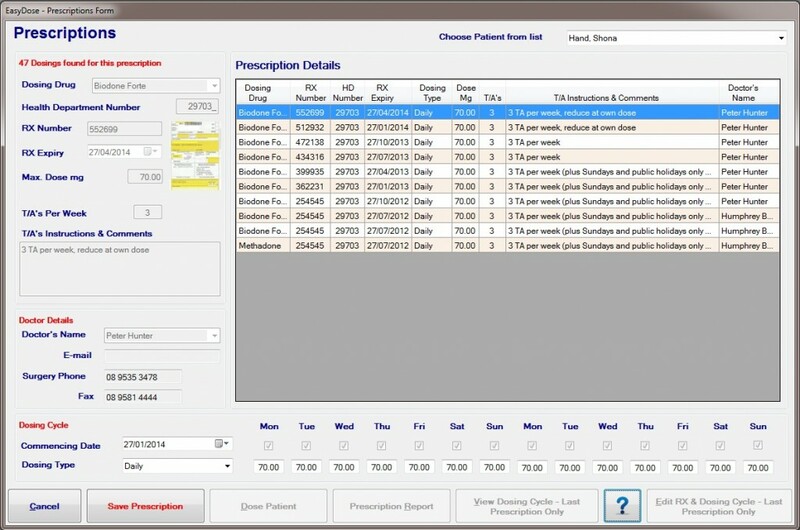 Clicking the ‘View Dosing Cycle – Last Prescription Only’ will open the following form which is read only. 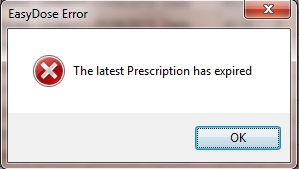 An expired prescription cannot be edited at any time. If you try to edit it, you will receive the following warning. A prescription which is not expired and does not have any valid dosing recorded against it can be edited along with the dosing cycle. The form will unlock the editable fields as shown below. Change the required fields and Save the Prescription. The current dosing cycle of any patient can be modified at any time. This is CRITICAL and applies mainly to Scheduled dosing and Alternate dosing. When a patient changes their cycle, particularly when part way through the cycle of a prescription, their new cycle must be entered against that prescription FROM THE DATE the new cycle is to commence. If this is not done, the Health Department Monthly Report will incorrectly calculate MISSED DOSES. This will mainly occur where a patient who is on Alternate Dosing, misses a day and then comes in the following day and then each alternate day. (Out of sync with recorded dosing cycle). The dosing cycle will unlock, as shown below, allowing the necessary changes to be performed. 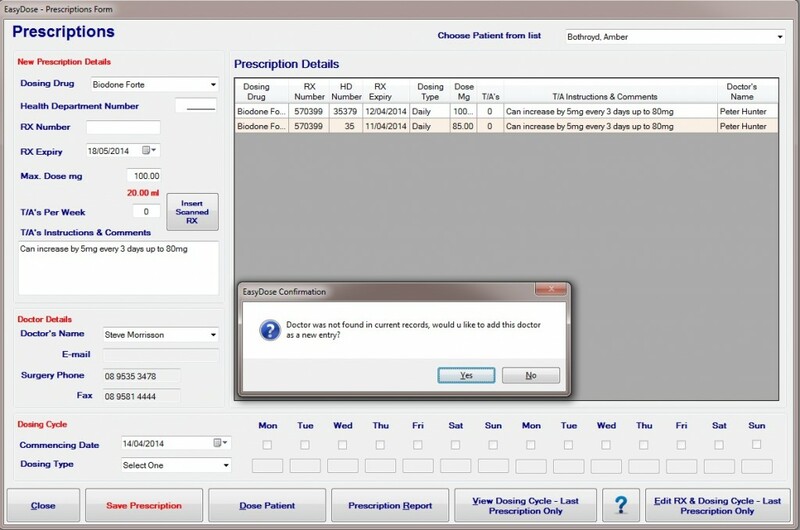 For expedience, while entering a prescription, if a doctor does not exist in the EasyDose, the user will be prompted to add the doctor. The Doctors Form will open which is to be completed in its entirety from the Prescription Form and saved. 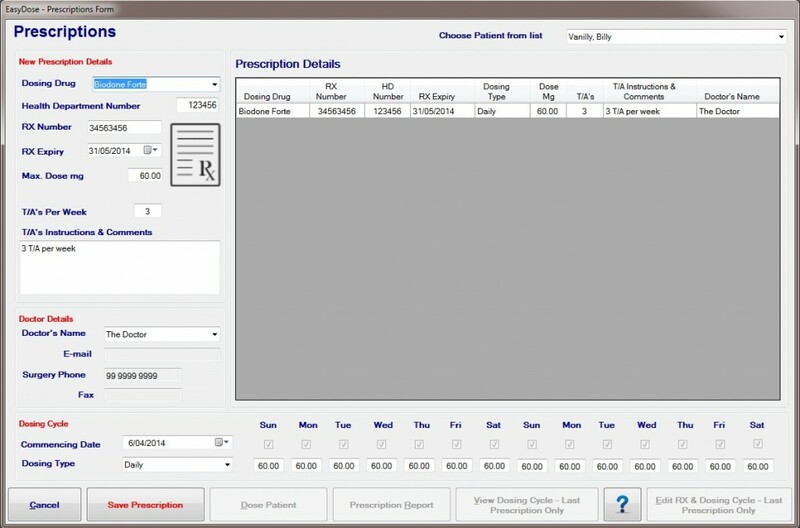 The new prescription will then record and show the new doctor details. Clicking ‘Yes” will open the Doctor Form at a new record but with the name entered into the Doctor’s Name field in the RX, populating in the Doctors Form.